While AccessAlly and ProgressAlly integrate with several marketing automation systems, you may want to connect other WordPress plugins to your CRM and ensure AccessAlly is aware of tags being modified. With WP Fusion active, you’ll see a new menu option for WP Fusion under the main AccessAlly settings menu. 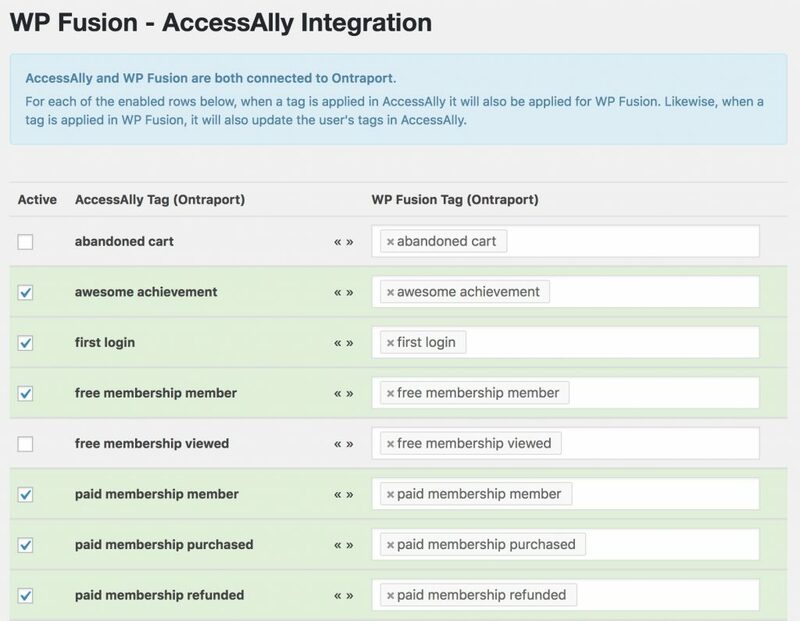 This page shows you a table of all your AccessAlly tags (in the left column) and available WP Fusion tags (in the right column). When the “Active” box is checked, the tags become linked between WP Fusion and AccessAlly. For example, to sell access to a membership using WooCommerce, you would configure the WooCommerce product to apply the tag “paid membership member”. When this product is purchased, the user will be able to access any AccessAlly content protected by the “paid membership member” tag. If you’re selling a subscription, when the subscription is cancelled the “paid membership member” tag will be removed, and the user will no longer be able to access restricted content in AccessAlly. It’s also possible to have AccessAlly and WP Fusion connected to two different CRMs. For example you could connect WP Fusion to Intercom or ConvertFox to deliver on-site messaging when Objectives are completed in ProgressAlly. In that case you can configure your AccessAlly objectives to apply the tag “awesome achievement” in Ontraport when they have been completed. This tag will then be simultaneously applied in Intercom, and can trigger an on-site message congratulating the user.